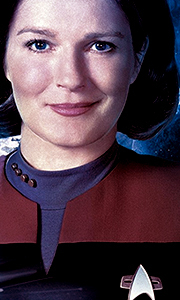 Star Trek: Voyager (VOY) focuses on the 24th century adventures of Captain Kathryn Janeway aboard the U.S.S. Voyager. Smaller than either Kirk’s or Picard’s starships—its crew complement is only 150—Voyager is fast and powerful, and has the ability to land on a planet’s surface. It is one of the most technologically advanced vessels in Starfleet, utilizing computer circuitry that incorporates synthetic neural tissue. Ironically, Janewa..
Star Trek: Voyager (VOY) focuses on the 24th century adventures of Captain Kathryn Janeway aboard the U.S.S. Voyager. Smaller than either Kirk’s or Picard’s starships — its crew complement is only 150 — Voyager is fast and powerful, and has the ability to land on a planet’s surface. It is one of the most technologically advanced vessels in Starfleet, utilizing computer circuitry that incorporates synthetic neural tissue. Ironically, Jan..